On 5 November 1993 the United Kingdom and the United States signed two maritime boundary Agreements. 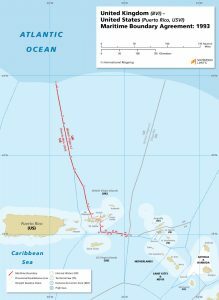 The first delimited a simple, two point boundary between the US Virgin Islands and the United Kingdom’s island of Anguilla. The second, between the US Virgin Islands and Puerto Rico and the British Virgin Islands, was based on a simplified equidistance line composed of 50 points.